It’s the first Secret Recipe Club reveal day of spring! This month, I was assigned to Bewitching Kitchen, written by Sally. Sally is a biochemist who was born and raised in Brazil, and has lived in Paris and California before settling in Kansas. She describes a little bit about her research in bacteria on her Science page. It sounds so interesting. I love to get a glimpse into what other people do for a living! Because of Sally's background, she has a whole section of Brazilian recipes, which all looked so delicious! She also has a section all about sous vide cooking, which is super cool! We do not have a sous vide, but after experiencing food cooked that way at a restaurant we both love, Joel has been wanting to get one pretty badly. I will most definitely revisit that section of Sally’s blog when we finally do get one. We started out the month trying to challenge ourselves with Meatless March. Because of that, I was limited by what I could choose. Don’t get me wrong, Sally has plenty of non-meat based recipes to choose from so it was not difficult by any means, but there were so many amazing looking recipes that included meat that I could not make. Long story short, the challenge fizzled and meat was quickly back in some of the foods we ate this month. 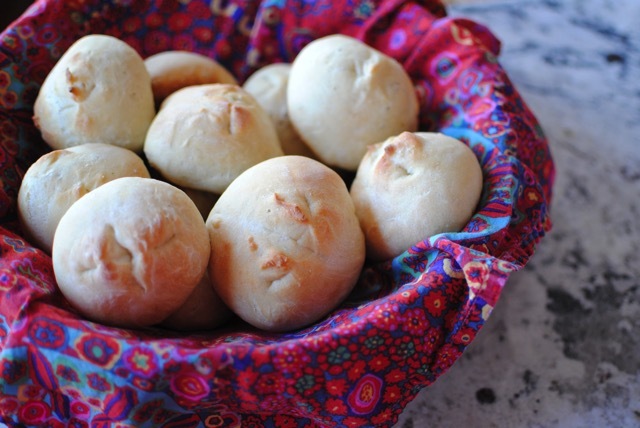 But, by that time, I had already settled on making these French-style rolls, so I didn’t stray from my plan, and I’m glad I didn’t. These rolls were amazing. While Joel is typically the bread-baker in our house, I’ve made a few recipes before that have either been too dense or too chewy, but this one had the perfect consistency; a nice crunchy crust with a fluffy interior that was great for both sopping up sauce and for making sandwiches! Thanks for letting me into your kitchen this month, Sally. I can’t wait to stop back and try some more of your recipes! In a small bowl, sprinkle the yeast over the warm water and set aside. To the bowl of a stand mixer fitted with the dough hook attachment (or alternately, in a food processor), add the flour and salt, mixing to combine. Add the cold water to the yeast mixture, then pour it into the bowl with the flour. Mix until the dough starts to form a ball. Adjust with additional flour if the consistency is too sticky or water if the consistency is to dry. Knead the dough (either with the dough hook or by hand) then place it into a bowl that has been lightly oiled. Cover and place the bowl in a warm spot to rise until doubled in size, about 1-3 hours depending not he temperature in your kitchen. When the dough has risen, shape it into either 12 rolls or 2 loaves and place them on a baking sheet to rise again until doubled in size, about 1 hour. Make a deep cross cut on the top of the rolls using kitchen scissors, or slash the top of the loaves with the blade of a sharp knife. Bake at 450 degrees for 20 minutes if you are making rolls or for 40 minutes if you are making loaves.